Sims Crane & Equipment is the name to trust with all of your industrial equipment rental, sale, and service needs. We offer a wide range of equipment rentals, including hoist elevators, cranes, forklifts, and more, and we have a large inventory of industrial equipment for sale at each of our 13 Florida locations. Additionally, we offer 24/7 crane service and support, and our team can quickly dispatch technicians, operators, equipment, and parts to job sites statewide. For 60 years, we have been industry leaders who are renowned for our safety training and education, and our experts have the expertise needed to provide you with best-in-class recommendations and top-notch service on each and every job. With value-added services such as 3D lift planning, in-house engineering, movement of traffic, crane safety training, free site consultations, machinery moving, and more, we are uniquely poised to be the single source for all of your industrial equipment needs. Why wait on shared equipment when you can get the job done faster with dedicated equipment on site? Sims Crane & Equipment can provide you with hoist elevators, cranes, material hoists, forklifts, and more to help your team get their tools and materials where they need it to be. As with all of our equipment, our material hoists are durable, well-maintained, and frequently serviced, so you can rest easy knowing that your equipment won’t break down on the job. Our hoist elevators are also easy to assemble to get you up and running fast, and we have options with varying lifting capacities to better suit your specific application. 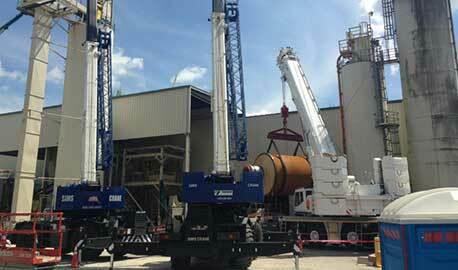 Sims Crane & Equipment offers daily, weekly, monthly, and flex-time rental periods for all of our rental equipment. Each piece of machinery can be rented with an operator or as a bare lease rental, and we offer comprehensive support services for turnkey crane and rigging operations. We are also pleased to offer crane service on rentals, as well as privately-owned equipment, and we regularly maintain all of our equipment to keep it in top working condition. In addition, we stock hundreds of parts across the state so that we can quickly dispatch parts to job sites whenever any equipment breakdown occurs. If you are looking for hoist elevators, need crane service, are interested in equipment rentals or have any other needs, contact Sims Crane & Equipment today. We have worked with hundreds of contractors in Mulberry and elsewhere throughout Florida, and we look forward to serving you!